In terms of flights, Scotland is easily and cheaply accessible. Both Glasgow and Edinburgh have international airports. Glasgow city centre is accessible from the airport by bus 747. This bus runs every 10 min and a 15min journey will get you to the Central Station. From there you can reach your accommodation on foot, since everything is located in the same area. Glasgow is the biggest city in Scotland. There are several interesting places to see, from the cultural aspect and from the entertainment one. Everything is relatively close, thus you don’t need to take any transport to walk around the city. Furthermore, the visit of the city won’t take you a long time, so if you fly there in the morning and have the rest of the day to have a tour in the city is more than enough. Our discover of the city will be dedicated first to the “ancient” and then to the “new”. 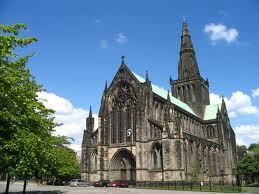 The tour can start from the Glasgow Cathedral, located at the top of High street. This church is built on the site where Mungo, the first bishop within the ancient British kingdom of Strathclyde, was thought to have been buried. It is the only medieval cathedral on the Scottish mainland to have survived the 1560 Reformation. From the Cathedral, return to High Street and after some minutes turn to George street, one of the main streets in the city. George street will take you to George Square, the main square of the city where the fantastic building of the City of Chambers is located. Keep going through George Street and then take York street on your right: you will arrive at the “new” centre, a set of streets surrounded by restaurants and shops. Sauchiehall street is probably the core. You can stop there for a break and if you like shopping you can stop by the big shopping mall over there. After a break, it is time to continue the visit. This time you will have to do a quite long walk through Sauchiehall str, North str and Expressway, in order to get to the Scottish Exhibition and Conference Centre. The reason why I suggest you to see this site is for its fantastic contemporary architecture. As you probably know, Glasgow has been elected City of Culture (1990), City of Architecture and Design (1999) and Capital of Sport (2003). 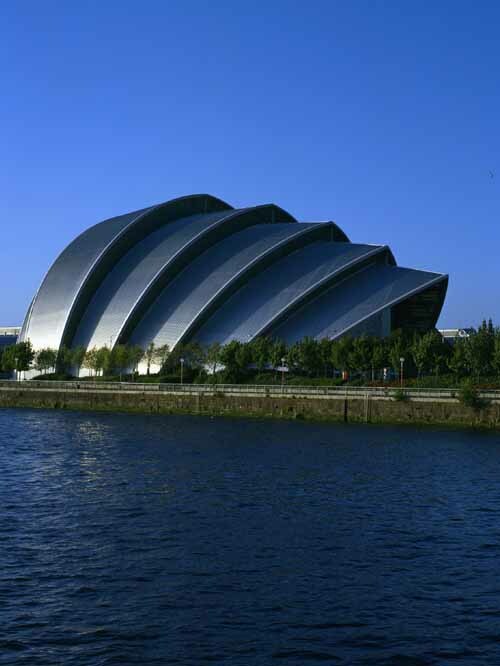 In 2008, Glasgow became the 2nd Scottish city to join the UNESCO City of Music (joining Bologna and Seville). All this has lead to an “explosion” of the city, a quick transformation from a industrial city to a dynamic and design city, with masterpieces of contemporary architecture and musical and cultural activities everywhere. Check the agenda of the events before you get there, you will probably find some interesting festivals or concerts. If the weather is nice and if you have some time left, do not forget to have a relaxing walk along the quay of the Clyde river, you will enjoy the quiet around you and the great view of the city and the river. A big part of this quay is pedestrian, so do not hesitate to wear your comfortable shoes or bring your bike. 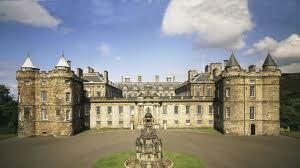 The second day of the trip must be dedicated to Edinburgh, one of the most charming cities in Europe. Being in this city will just make you feel immersed in the great past of Scotland and the wonderful people will make you feel more than welcome. Enjoy every single second in this fantastic place! Reaching Edinburgh from Glasgow is extremely easy: there are trains every 10mins and the trip will take you only 1h. Once you get off the station you will be in the heart of the city. 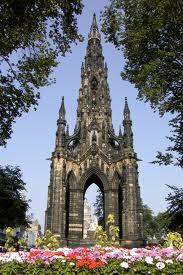 You will see in front of you a very nice park hosting a monument to Walter Scott. Just behind the Walter Scott monument is the National Gallery, a very interesting museum with a permanent area and a temporary exhibition area. I strongly suggest you to have a tour inside this museum, it contains several masterpieces of the Scottish and European art. And here is something very special of Edinburgh: apart from special temporary exhibitions, all museums’ entrances are completely free! The Scottish Ministry of Culture (God bless them!) decided not to charge visitors for their museums (you’re charged only for special exhibitions, but still not a huge amount like in other cities) and they even organize free buses that take visitors from a museum to another! An excellent example on how to promote the arts and culture. After a nice visit at the museum, take the streets that go uphill and you will arrive at the most famous place in Edinburgh: the castle. Edinburgh Castle is a big fortress which dominates the skyline of the city. Human habitation of the site is dated back as far as the 9th century BC, and during the following centuries it has been house of kings and territory of wars. Nowadays you can access there and visit all the fortress and the War Museum. 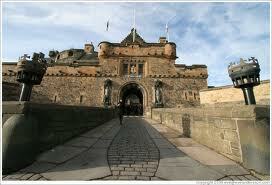 Going out from the Edinburgh Castle, you will be in High Street, one of the main streets of the city. Many restaurants and shops are there, together with some historical buildings such as the St Giles Cathedral and the Parliament House. From High str, take any street on the left that will take you back to Waverley Station. Now cross the station and go towards Queen street. This is also a very interesting street, with a beautiful garden on a side and with very nice and fancy houses. From Queen str, you can take any small street on the left and you will get to George str or Rose str, a pedestrian area with very nice bars, restaurants and shops. This will be also the area where you can enjoy Edinburgh’s nightlife. The second day in Edinburgh can be taken very easily, since it will be a day dedicated to the relax and admiration of nature. You will probably have a late morning after the scotch you have been drinking the night before, so once you take possession again of your abilities go out and start exploring the second part of the city. Take again High Street, this time on the opposite side as the castle and you will eventually arrive to the Palace of Holyroodhouse, the official residence of the British Monarch in Scotland. The building is very nice, but what catches the attention is the unique landscape in front of it. You will see a great park with fountains and a big rock on the back, a pure mixture of green, blue and grey, a great spot of nature inside the city. 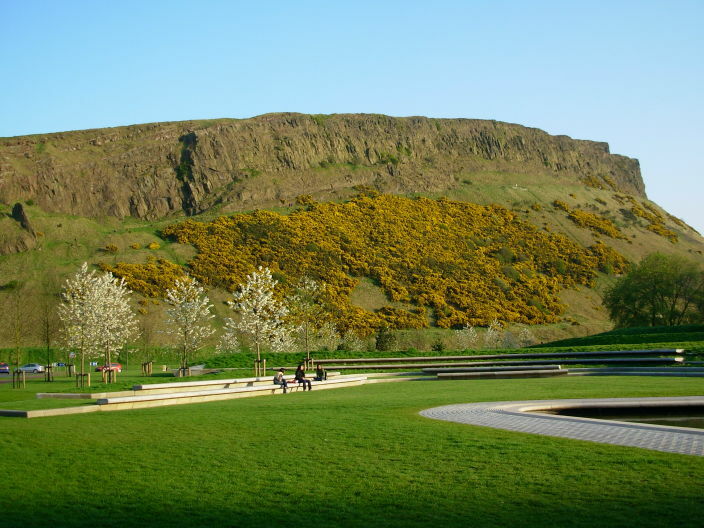 The Holyrood Park is huge, so take your time to visit it and get immersed in the calm and nature. Once you finish the visit of the park and come back the Palace of Holyroodhouse, you can also visit the green spots on the other side, for instance Calton Hill. Once you finish visiting these great places, you will still have some free time in front of you. You can use it to buy some souvenirs in High str , or you can go to the Museum of Antiquities and the National Portrait Gallery in Queen str, or you can have another bottle of scotch before hitting the road.